By turning sustainability initiatives into drivers of measurable value, some CEOs are outperforming their peers and forging a path for others to follow. Authors of and participants in the 2013 UN Global Compact—Accenture CEO Study on Sustainability comment on the way forward. Are businesses worldwide doing enough, fast enough, to effectively address the challenges of sustainability? Not according to business leaders themselves. This is one of the clearest messages to emerge from the most recent UN Global Compact–Accenture CEO Study on Sustainability, which is the UNGC’s third and most extensive survey to date (see Sidebar 1). Today, the UNGC has nearly 8,000 member companies (twice as many as at the time of the first study, in 2007), so corporate commitment to sustainability is, by some measures, bigger and stronger than ever. Moreover, some 84 percent of CEOs polled report that at their companies, the issue is discussed and acted on at the board level, which strongly suggests they’ve made the case within their organizations for environmental responsibility and human and labor rights, and against corruption (the UNGC’s core sustainability principles). Yet many CEOs we spoke to are also deeply frustrated with the collective failure of the global business community to accelerate the pace and enlarge the scale of change—so frustrated that more than 80 percent of respondents now want their governments to create a level playing field. Shaped by regulation, taxation and other key policy enablers, this intervention would help business set and meet ambitious sustainability goals by incentivizing leaders and penalizing laggards, effectively putting a market price on social and environmental costs. The failure to establish a link between their sustainability initiatives and business value is the fastest-rising headache for CEOs—37 percent of those surveyed, to be precise, compared with 30 percent in 2010 and just 18 percent in 2007, the year of the first study. Indeed, the more adept they become at measuring and tracking their own sustainability performance, the more CEOs come up against an apparent inability to tie those improvements to the fundamentals of business value, beyond incremental gains. Between lukewarm investor interest and mixed signals from consumers and governments, even companies that have been leaders on sustainability issues tend to feel that collective ambition and achievement may have plateaued. Not all, however. There are a few organizations that aren’t waiting for policy makers to facilitate large-scale sustainability. These leaders recognize that the very urgency of the sustainability challenge provides them with an opportunity to differentiate for competitive advantage. What’s more, they are actively building new business models that by monetizing sustainability—through innovative products and services—promise to turn it into a driver of top-line growth. 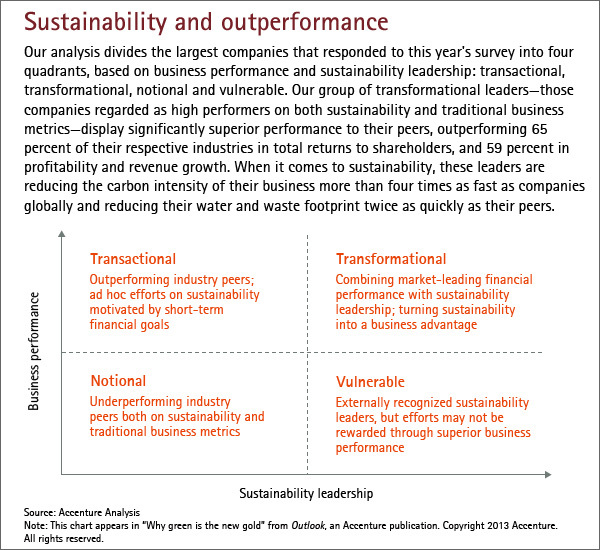 By using Accenture’s High Performance Business methodology to do a comparative analysis of both the business and sustainability performance of 77 of the biggest companies that responded to our survey—a first, we believe, in research terms—we have identified a small group of “transformational leaders” that are managing to combine externally recognized sustainability leadership with significant market outperformance. CEOs of such companies approach and frame the sustainability challenge differently than those businesses that fail to perform at this high level. Their motivations and influences are different, and they prioritize specific areas for investment, innovation and action. They show, in short, a very different mindset. From our conversations with these CEOs, we have identified seven key areas where the distinctive mindset of these pioneers is most critical to sustainability success. Pioneering players are more pragmatic than their peers. They have no illusions about the scale of the sustainability challenge—and in interviews, they were more likely than their peers to acknowledge that business isn’t doing enough to resolve it. But they also see the challenge as an opportunity for future growth, and recognize that deciding how to exploit that opportunity requires a long-term view. Consider, for example, the approach taken by Novozymes, the Denmark-based industrial biotech multinational, which uses sophisticated forecasting techniques to predict future trends in natural resource production and supply. This has enabled the company to successfully anticipate significant future growth opportunities in reducing its customers’ vulnerability to the wildly fluctuating prices of most raw materials. By targeting innovations that lower such inputs—non-oil-derived enzymes that reduce water and energy consumption in the laundry industry, for instance—Novozymes is helping its customers cut costs, while driving more sustainable business. Similarly, Wisconsin-based Johnson Controls keeps a close eye on the likely future direction of government regulation, particularly in the automotive and building sectors, where most of its customers reside. This focus has helped Johnson become the first company in the world to produce low-energy, rechargeable lithium-ion batteries for mass-produced hybrid vehicles. And its renewable energy innovations in building efficiency have cut its customers’ CO2 emissions by more than 19 million metric tons and generated savings of $7.5 billion since 2000. Because many companies are still primarily reacting to external forces—citing the shaky recovery as a reason to focus on short-term issues—their sustainability efforts are incremental and focused largely on mitigation. Transformational leaders, by contrast, are seizing the initiative, leveraging sustainability as a chance to differentiate themselves from their competitors with truly innovative products and services, and to enter new markets. For them, indeed, sustainability is offering a way out of the economic crisis. Siemens, for example, achieved strong growth throughout the downturn by focusing on innovative technologies that enable the transition to clean energy and intelligent infrastructure. Smart grid technologies loom large in its energy portfolio. And the German engineering and electronics giant has provided more than half of the installed capacity of the world’s offshore wind turbines—which keeps 4 million tons of CO2 annually out of the atmosphere (compared with the emissions generated by producing the same amount of energy conventionally). Small wonder that in 2012, revenue from Siemens’ Environmental Portfolio—the sustainable products and services that now comprise the company’s fastest-growing unit and account for 42 percent of its total business—rose 10 percent, to €33 billion. Many organizations now track such environmental measures as carbon emissions and water use. But those that have moved beyond incremental change do more than measure and manage these sustainability metrics. They also quantify the value of their more sustainable business models to the company, motivate both leadership and employees to meet targets, and monitor the impact of their actions on the communities where they operate. In Nigeria, for example, by substituting sorghum for barley in the beer brewing process, Heineken is boosting demand for one of the West African nation’s main crops—and thus supporting the government’s attempts to improve agricultural productivity. The production and sale of Heineken’s products in Nigeria, where beer consumption is growing at an estimated 8 percent to 9 percent annually, also employs 0.75 percent of the labor force and contributes 4.57 percent of non-oil tax revenues. In addition, Heineken’s sorghum development program is helping the small farmers who provide more than 15 percent of its local sorghum needs to improve yields by offering them better seeds and farming techniques. Leading companies are securing business advantage through innovative R&D and the deployment of disruptive technologies in the sustainability sphere. Perhaps most notably, they are building the closed loops—or circular value chains and business models—that can spread the impact of sustainability initiatives across sectors and industries. The most exciting initiatives often occur at the confluence of sustainability and digital business, giving rise to “smart” technologies that drive stakeholder engagement by enabling customers to improve their own sustainability performance, as well as boosting resource efficiency and business benefits. For example, by engaging all stakeholders in a recycling initiative that reduces the whole-life cost of products and services, such models decouple growth from increased resource use. In fact, recent research suggests that such initiatives can reduce a product’s environmental footprint by between 50 percent and 90 percent. Witness how Philips, a technology company in healthcare, consumer lifestyle and lighting, has combined product innovation with the molding of buying behaviors to grow new markets for the lighting solutions that now account for just over one-third of its revenues. The most recent version of Philips’ EcoVision program, launched in 2010, aims by 2015 to double both the collection and recycling of end-of-life products and the amount of recycled materials used in its products. CEOs know they can’t achieve sustainability alone. And the most progressive players are seeking to maximize their impact by partnering with peers, policy makers, consumers and NGOs. We see this trend in our own company, in the increasing amount of work that our commercial business is doing with Accenture Development Partnerships, our ring-fenced not-for-profit, which serves NGOs and the development sector. Another case in point: the Medicines Patent Pool, a Geneva-based initiative that unites the World Health Organization, the Bill & Melinda Gates Foundation, and several big pharmaceutical players—including ViiV Healthcare, a joint venture between the United Kingdom’s GlaxoSmithKline, New York-based Pfizer and Japan’s Shionogi—in a UN-backed effort to increase access to quality, appropriate, affordable medicines for people living with HIV in developing countries. To date, this initiative has signed agreements with companies including California-based Gilead Sciences, a number of Indian generic manufacturers and ViiV Healthcare. By partnering both within their industry and across sectors, these leading companies can multiply their impact on global healthcare challenges, securing the long-term well-being of the communities in which they operate while simultaneously building new markets. Rather than acting first, and then communicating what they’re doing to their various stakeholders, leaders are actively engaging those stakeholders in a two-way dialogue. By talking constructively with consumers and local communities, regulators and policy makers, investors and shareholders, employees and labor unions, they are refining the strategies that can address sustainability challenges. In some parts of the world, where traditional philanthropic values still prevail, CEOs already factor the well-being of the wider community into the way they run their businesses. In Asia, for example, this lens of proximity shapes thinking about sustainability to an extraordinary degree (see Sidebar 3). But sustainability leaders in both developed and developing markets have moved beyond philanthropy and traditional community affairs engagement models to develop stakeholder conversations that actually drive value. By crowd-sourcing ideas for sustainable technological innovations in a process known as open innovation, Unilever, for example, is enhancing its own R&D efforts, and reinforcing its chances of fulfilling the goals of the Unilever Sustainable Living Plan, which aims to halve the environmental impact (and boost the social benefits) of the company’s products while growing its business. CEOs want government to shape the global landscape for sustainable business. But progressive CEOs also know that business can (and, indeed, should) play a key role in shaping public policy and regulation. And they are moving beyond industry-specific lobbying to engage constructively with policy makers on broader sustainability issues. Responsible self-regulation can also help build public trust in business as a partner in policy making. The Roundtable on Sustainable Palm Oil, for example, was established to promote the growth and use of sustainable palm oil through cooperation within the supply chain. The initiative aims to transform markets, making sustainable palm oil the norm by advancing its production and monitoring the impacts of its uptake, as well as by developing global standards for the entire supply chain and engaging all stakeholders, including governments and consumers. The scientific warnings on sustainability are unequivocal. Take just one: If present trends continue, we will need reductions of up to 11 percent in energy intensity (or total energy consumption per unit of GDP) on every global dollar of economic output, in every country, in every year until 2050 to avoid passing the upper target for atmospheric carbon dioxide that was established in 2007 by participants in the UN-backed Intergovernmental Panel on Climate Change. This means that pursuing business as usual is not only no longer acceptable—it’s inherently unsustainable. And time is fast running out for the majority of global companies that claim they can’t make further progress in sustainability without government help. The pioneering players profiled in this article, however, are already driving significant business value with their bold and imaginative sustainability initiatives. While there’s clearly some way to go before they constitute a majority, the time to join them on the path to high performance and sustainability impact is now. The research described in this article is an outgrowth of Accenture’s partnership with the UN Global Compact, a strategic initiative launched in 2000 that invites business to commit to the development, implementation and disclosure of sustainability policies and practices. With nearly 8,000 members worldwide, the UNGC program is thought to be the largest voluntary corporate responsibility initiative ever undertaken. Accenture joined the UNGC in 2008, and is also a member of its platform for corporate sustainability leadership—Global Compact LEAD—set up in 2011 to spearhead new efforts to raise sustainability performance. We pursued two principal strands of research in this year’s study—the third in six years. First, we conducted more than 100 in-depth interviews with global business leaders, including 77 CEOs, chairpersons and presidents of United Nations Global Compact member companies across 28 countries and a broad spectrum of industries. An additional 30 interviews were conducted with other senior leaders, including executive board members, civil society leaders, external experts and Global Compact board members. In this year’s sustainability study, Accenture broke new ground by comparing (for the first time, we believe) companies on three axes (the analysis looked at 77 of the largest that responded to our survey): their business performance, their sustainability performance and the attitudes of their CEOs (that is, the way they responded to our survey questions). We assessed these companies against Accenture’s 2012 analysis of 2,000 companies in 40 industrial sectors, using our High Performance Business methodology to score their corporate performance across three- and seven-year time horizons in regard to eight metrics: total return to shareholders; profitability; revenue growth; consistency in value creation; future market expectations; market differentiation; market position; and fuel for growth. As a result, we isolated a small group of companies that we have dubbed the “transformational leaders.” These companies outperform their industry peers across a range of traditional business performance metrics. In an analysis of company performance over three- and seven-year time horizons to 2012, for instance, this group on average outperforms 65 percent of their respective industries in total return to shareholders. These companies also outperform 59 percent of their respective industries in both revenue growth and profitability, and a whopping 69 percent in their consistency in these metrics from year to year. The results are particularly striking when compared with those companies that both underperform their industries and fall short on sustainability. On average, these players outperform only 20 percent of their respective industries in the consistency of revenue growth, profitability and shareholder returns. In this year’s study, we made a special effort to increase the participation of CEOs in Asia—home to some of the world’s fastest-growing economies, and where many sustainability issues will play out most significantly in the coming decades. Our investigations revealed that while there is no single “Asian” view, CEOs from the region collectively believe much more strongly than their global counterparts that fiscal policy, subsidies and incentives are necessary to promote sustainable growth on a level playing field, and that government regulation needs to be constantly revised and updated in order to avoid inhibiting innovation. Furthermore, Asian CEOs have a rather different take on what sustainability actually means. For many companies based in the region, sustainability remains largely a matter of business ethics and leadership values—cornerstones of the traditionally close links between what are often family-owned businesses and the communities in which they have long operated. Many think of sustainability as a commitment to the health and prosperity of local people—a social contract that ensures stability and longevity rather than a value-driving concept embedded in a company’s core business. Indeed, fully 70 percent of the Asian CEOs surveyed (versus 51 percent globally) still view sustainability largely as philanthropy. And in interviews, several expressed skepticism about what they consider the short-termism of the Western, economic-value-led approach. A few, however, have recognized the merits of such an approach in building sustainable innovation to support their traditional, long-term view. Take, for example, Japan’s Daiwa Securities Group, which has launched impact investment bonds—$4.6 billion worth between 2008 and 2012 alone—to facilitate investment in sustainable initiatives in clean energy, microfinance, reconstruction, development, healthcare and education. Or consider PTT, Thailand’s leading energy company, which has partnered with universities and other academic institutions to establish the Learning Triad for Sustainability. Its three pillars—talent and education, people and training, energy literacy—are designed both to build hard skills in engineering and energy research for Thai companies and to foster greater public understanding of energy and its future. Other Asian companies have recognized the value of partnering with policy makers to drive their sustainability goals. In India, for example, Tata Power Delhi Distribution has leveraged a government initiative, the India Smart Grid Task Force, designed to implement smart solutions for energy conservation. By distributing 40,000 automated meter-reading systems among the 5 million consumers it serves in the nation’s capital, Tata Power has improved the efficiency of the distribution network, reduced power outages—and expanded its customer base. Meanwhile, as prosperity grows in China, CEOs are adopting a strong consumer focus in their sustainability strategies. More than half of Chinese CEOs in our survey believe they have secured a price premium with consumers through this approach. And the leaders continue to innovate with sustainable solutions. is the Shanghai-based managing director of Accenture’s Strategy and Sustainability Services in the Asia Pacific region. is a London-based manager in Accenture Sustainability Services.